New Zealanders want a welfare system we can be proud of. The system must support people who genuinely can’t support themselves, but those who can work should be available for work and actively looking. Better resources and support to help more people off welfare dependency and into work is a clear priority. The system has failed too many New Zealanders by creating dependence and the Ministry of Social Development is moving towards a more active approach that will see greater support in helping more people off welfare and into work. Young people are a clear priority within welfare reform. We know that those who go on welfare young tend to stay longer than others and have poorer opportunities as a result. Of real concern are the 16 and 17 year olds who become disengaged from education, employment and training and who are on a collision course with the adult welfare system. Teen parents also stay longer on benefits than those who become parents at an older age. On average, a teen mother will spend more than seven of the next 10 years on the Domestic Purposes Benefit. The welfare system has allowed very young people and teen parents to gain access to a benefit, with very little support. We will not continue to fail these young people by handing them a welfare cheque and leaving them to their own devices. The Ministry of Social Development is engaging with youth service providers who will work with these vulnerable young people in a very new way. Whether or not they receive a benefit, those 16 and 17 year olds and 16–18 year old teen parents at risk of going on or remaining on welfare long term will receive wrap-around support. Sole parents will also receive much greater support to move into work, as previously this was a group that attracted little work expectation or assistance. The integrity of the welfare system must be protected and the Ministry of Social Development will continue to improve systems to prevent fraud and abuse of the benefit system. This includes better, faster data matching and getting tougher on those who do abuse the welfare system which is there to support those in genuine need. These changes are about greater expectations to ensure more New Zealanders participate fully in our economy and society. We are rebalancing the incentives and obligations and ensuring the welfare system is fair to those who use it and those who pay for it. This morning Don Brash delivered a speech to the Institute of Chartered Accountants on the effects of yesterday's budget. 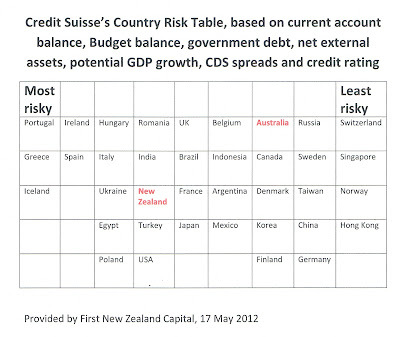 This table appeared in the notes. 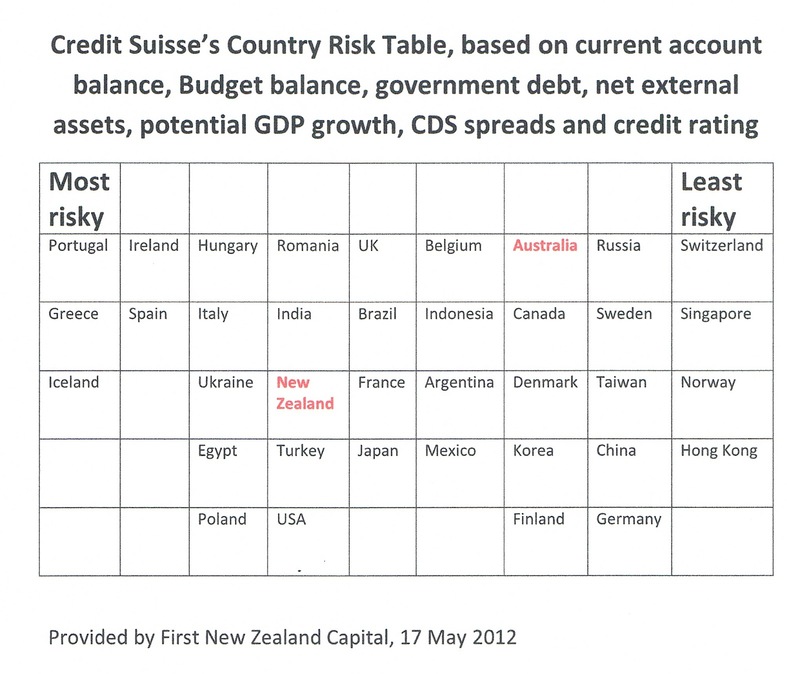 NZ has the same risk rating as the US. "Public not fooled by media"
I think the correct word is dichotomy, but I had to look it up in the dictionary. It means when two parts are sharply opposed. So it would be fair to say that a dichotomy exists between what I read, hear and see in our media and the regularly published political polls. "Key has blown it" read one headline. "National self-destructing" said another. The guts of the comments made under these strident headlines go along the lines of, "since the November elections John Key and his National Party seem to have gone down a path of sheer political madness". 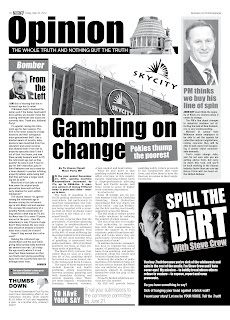 "Their proposed partial asset sales, the deal-making with SkyCity, the ACC problems and the sale of the Crafar farms to a Chinese group, all spell political doom for this hapless Government." Not so, say the polls. In fact, they have shown an increase in support for Mr Key and his merry band of politicians. This hapless Government now has more support than on election night. Obviously, the public likes strong and positive leadership and doesn't believe the media's interpretation of events. So how can the press get it so wrong? Here I begin to tread carefully, for it is a writing sin to overgeneralise, but could it be that our reporters are hoping that Mr Key and his government have a serious pratfall? My many years of experience with the media have taught me that, in general, most of them lean to the Left in their personal political persuasions. The job attracts that type of thinking, with a strong emphasis on social justice and a dismissal of capitalist necessities of day-to-day economics. Those who are professional put these leanings aside and publish what they consider is true and correct and do a fair job. Some just let all their prejudices hang out. The relationship between politicians and journalists is a very delicate one. They both need each other to do their jobs properly. Both tread warily in each other's presence. I always felt journalists didn't like politicians and were envious of them. 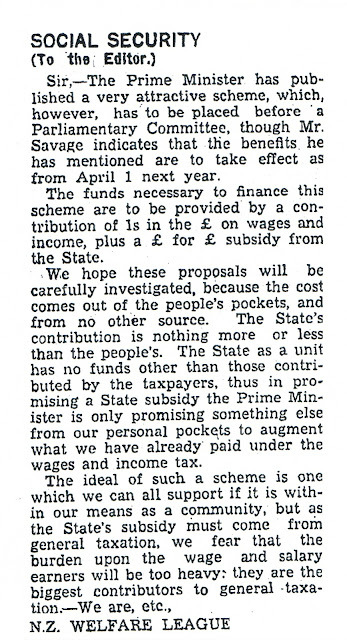 I am aware of only two journalists who have become MPs: Fred Doidge in 1936 and Brendon Burns, who lost his Labour seat in the last general election. Interestingly, in my time in that establishment, the members of the Press Gallery formed the strongest journalists' union in the country. So I think it would be fair to say that the re-election of Mr Key's Government was not greeted with overwhelming joy and elation at the bar in the Press Galleries lounge. The reporting since that time has been continuously against the Government. It's as if the professional reins have been loosened. There is a feeling that the proper Opposition has not fired under its new leadership, leaving a void that some journalists have felt they should fill. Our Fifth Estate is very powerful. While at present there is a dichotomy between what is reported and the polls, if the media are of a mind to attack Mr Key's Government over the next year or so, they will play a part in eroding its public support – they are that powerful. Someone like Kim Hill with her three hours of interviewing Left-wing international personnel every Saturday morning has an ongoing effect on people's political views. It's a bit like Chinese torture: drip, drip, drip. She is the only woman I know who can consistently get me out of bed at 8am on Saturday. Then on Sunday morning on National Radio we are gently badgered by former Labour MP Chris Laidlaw. He never pulls punches when the political Right gets in his way. Together, these two articulate and persuasive presenters are a concerted voice for the Left. 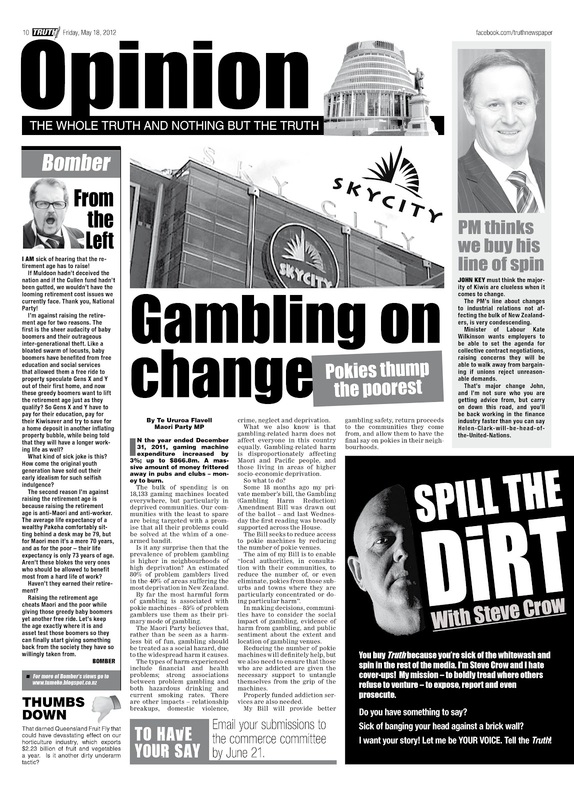 I've said it is dangerous to generalise and I should acknowledge some of the editorials that have been positive about the actions taken by Mr Key particularly over events such as the SkyCity deal, which has so much of an upside for New Zealanders. Mr Key is a deal maker to the core and has been since I worked with him when he was a young foreign exchange dealer in a merchant bank in Wellington. That can only be a positive for this country and I suspect that the public appreciate that and reflect their views in the polls. Across the entire sample, 52 percent of offenders released from New Zealand prisons in 2002/03 were convicted of a new offence and were returned to prison at least once during the 60-months follow-up period. Hon ANNE TOLLEY (Minister of Corrections): Yesterday the Associate Minister of Corrections and I announced that Budget 2012 will contribute to a 25 percent reduction in reoffending by 2017, and 18,500 fewer victims of crime every year from 2017. In other terms, in five years time, instead of 5 in 10 prisoners re-offending, New Zealand can look forward to 4 in 10 re-offending. I can hardly wait. In the budget run-up Every Child Counts is warning the government they must invest in children. “As we head into Budget 2012, it is time for the government to publicly acknowledge the significant return on effective investment in children and assure the public that their policies will improve life for our most vulnerable children,” says Jenny Prince, Every Child Counts Steering Group member and CE of Plunket. At the same time, a new study from the US casts doubt on whether the welfare state can make up for a lack of two parent families. The study compares US and UK cohorts. When the first Old Age Pension was introduced in 1898 - over one hundred years ago - the qualifying age was 65. Fast forward to 2012 and the qualifying age is still 65. Given male life expectancy has risen from around 62 to 79 this seems astonishing. 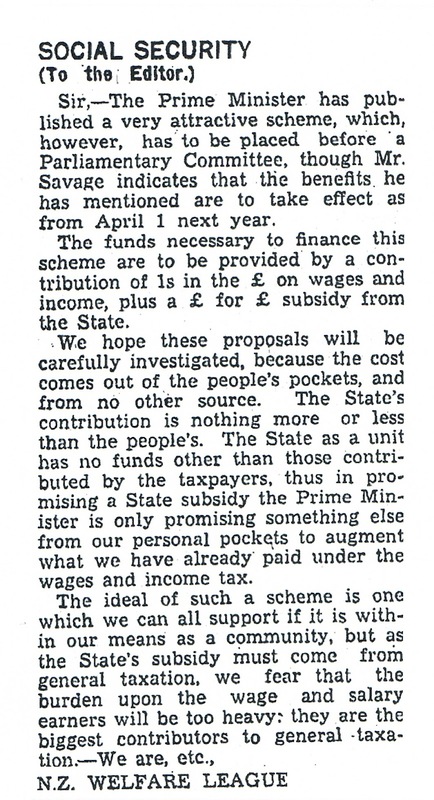 Like so many government assistant schemes, pensions for the aged began as a tightly controlled, rather stringent programme but gradually ballooned, becoming a political football in the process. That's exactly what Super is right now with John Key staking his Prime Ministership on retaining the status quo. Personally, I have never understood this intransigence. I asked him directly via a talk show question and answer session - why? He responded, during the 2008 election it became apparent that Labour was going to embark on a whispering campaign about his party's intention to raise the age. Thus he decided to put the mockers on it quick smart. But it wasn't smart. Super is a huge cost with the youngest recipients accounting for a disproportionate share. The yearly bill for 65 and 66 year-olds alone is around $1.3 billion Looking ahead, as the baby-boomers age, the size of the workforce is going to shrink relative to the size of the 65 plus group. As one of them, I am uncomfortably aware of this. My kids will be (increasingly?) taxed to keep me. So what, you may say? Hasn't that always been the way? Yes, but we haven't faced this kind of demographic change in the past. As are many European countries and the US. That's why they are lifting their entitlement ages. Uncharacteristically Key has read this one wrong. When Phil Goff made lifting the age Labour policy in 2011 many people sensibly approved. Politicians are renowned for flip-flopping and generally we denigrate them for it. But this is one instance when a change of mind might reap kudos rather than derision. 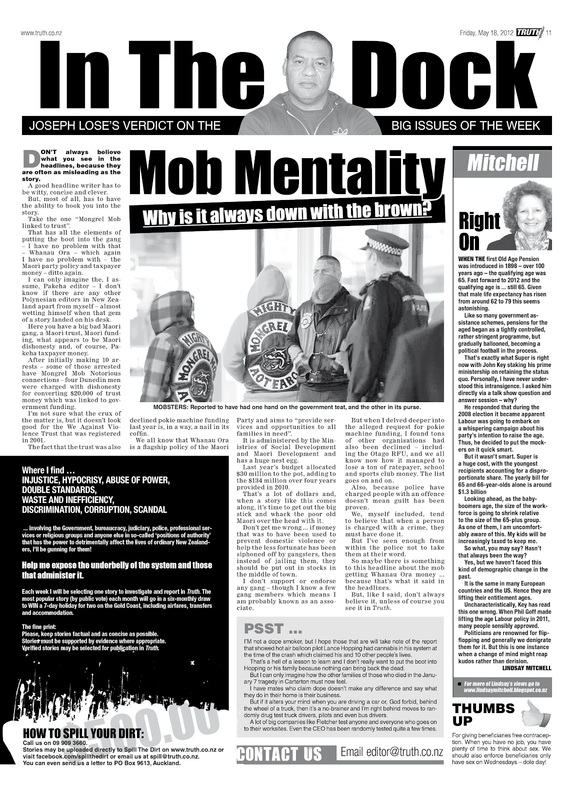 Link not up yet but the editor's column is here. "If we really want to reduce teenage pregnancy and abortion it would be more principled, and just as cost-effective, to offer it to all young women." Stupid. But I have heard this sentiment over and over. Who can believe it comes from the mouths of lefties who in the very next breath are demanding all sorts of targeted assistance for the poor. But if we treat contraception as purely a health matter anyway, it is the poorest teenagers that become teenage mothers. DHB statistics illustrate this fact. So prevention is targeted at that group. I wonder what McCarten thinks of the targeted funding for the reduction of rheumatic fever? "Today we announced that as part of Budget 2012 we are doubling the spending, from $12 million to $24 million, over the next 4 years to reduce rheumatic fever in vulnerable communities. We currently have 101 schools engaged in the rheumatic fever campaign, targeting 35,000 children in seven regions. This new funding will allow more schools and more children to be targeted in this preventive programme. Around 70 percent of children who get this Third World disease will suffer some heart damage, but with proper treatment that risk is dramatically reduced. McCarten's idea of "principled" policy would require the programmes to be run in all communities whether or not rheumatic fever is a problem.